The Granny Peace Brigade Group is back in court today in NYC. They are facing charges that they blocked a military recruiting station… not a very peaceful brigade of grannies, huh? 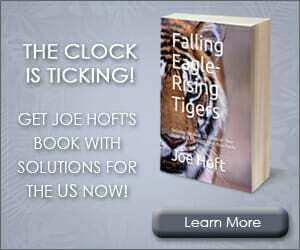 Sounds like they pulled the ol’ Code Pink tactic. 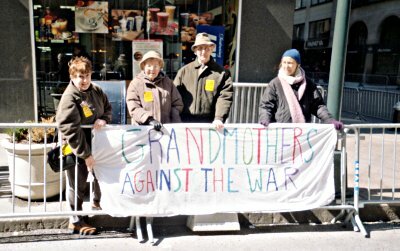 The grandmothers, all members of the “Granny Peace Brigade” were arrested in October during a protest outside a military recruiting station in Times Square. 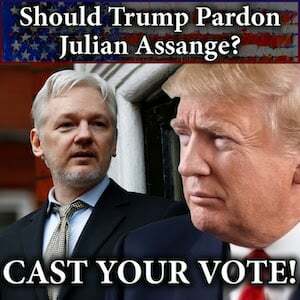 They were charged on two counts of disorderly conduct, for blocking the recruiting station door and refusing to comply with a police order. More on the graybats here. 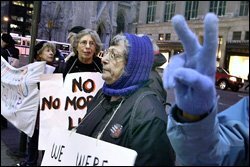 On Tuesday, January 10th, 2006 at 9:30 a.m. the 18 grannies of the Granny Peace Brigade will appear at Criminal Court in connection with their October 17th action at the Times Square Recruiting Center. 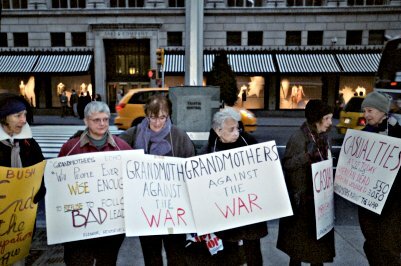 The Grannies, many of whom have maintained a “Bring the Troops Home” vigil for two years on Fifth Avenue, attempted to enlist but locked doors prevented them from entering the recruiting center, whereupon they sat down on the sidewalk. The police then arrested them and they were put into wagons, handcuffed (in back). Yoah, Dude! 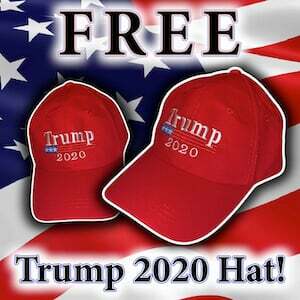 You a granny?